One man is dead after speeding car crashed into a Cape Coral pool. Three more have life threatening injuries. 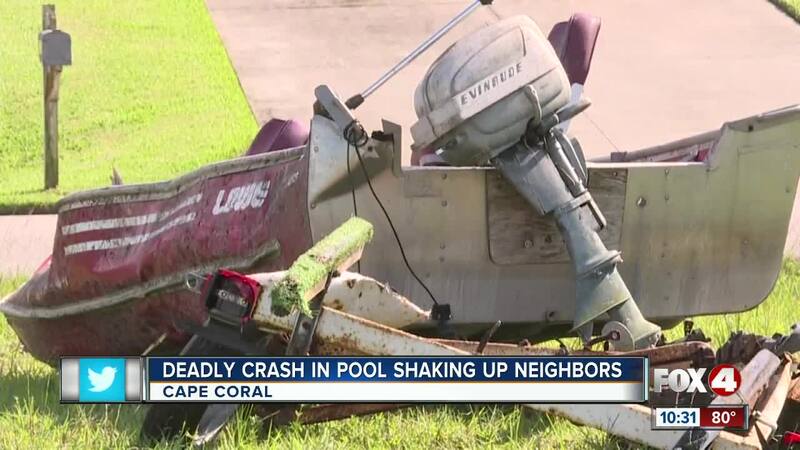 Police say a speeding vehicle crashed into a pool in Cape Coral just after midnight Saturday, leaving one man dead and three others with serious injuries. Resident Steven Rineberg was home when the black RAV4 crashed into his roof and landed in his pool. "They drove through the grass from way where that stop sign is straight to here," Rineberg said, pointing to th road and then to his front yard. "(The car) flipped off the boat then went on the roof," Rineberg said. The impact from crashing into the boat made the SUV fly into the air, hit Rineberg's roof and finally land in the pool. Everyone in the SUV was under 21 years old. The front passenger, 20-year-old Michael Alen Velez died and the three other males in the vehicle have life-threatening injuries, including the driver. While police haven't figured out the exact cause of this crash, neighbors say speeding is a continuous issue in the area. Glass is still in front of the house from the crash. Residents said that they are traumatized to think someone died in their pool. "They’re all tragic. These fatalities are what we refer to as random acts and it basically comes down to the choice of the driver," said Jay Anderson, founder of "Stay Alive, Just Drive." Anderson said speeding is a leading cause for fatal wrecks and warns drivers to consider how many people can be affected. "It’s not just you. The minute you put passengers in your vehicle, you have that added responsibility, but then there’s everyone else around you," said Anderson. "Someone in that home could’ve been injured. They could’ve struck another home and injured people. I mean fortunately it only involved the people in the car themselves, but realistically it could’ve been more tragic." Police said drugs or alcohol were not factors in this crash but are still investigating the cause.